Need help with video game emulators? This is the BEST site for help with video game emulation. 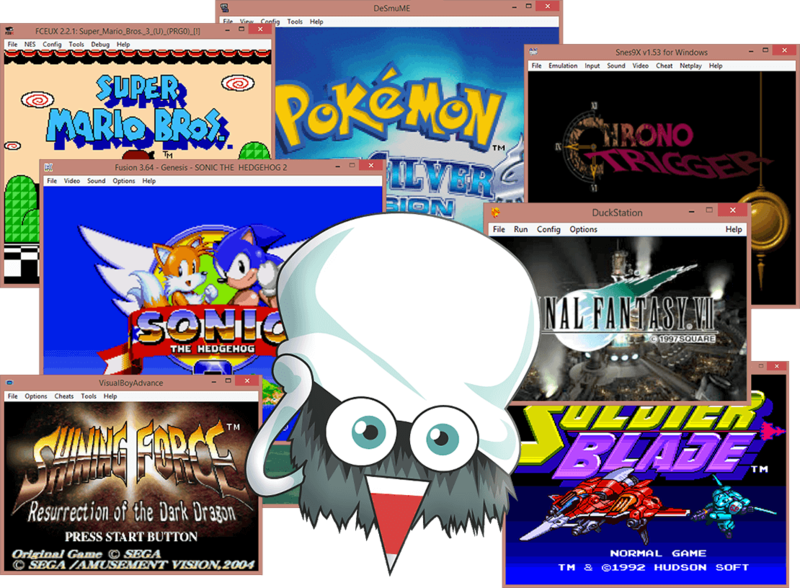 Here you will find a thorough introduction to emulation and tutorials for the most popular emulators. Everything a newcomer needs to know about video game emulation: what it is, the cool things it offers, and the legality. I review a few details pertaining to downloading ROMs. I also walk you through some basic Windows tasks such as how to work with zip files. The emulation experience isn't complete without a gamepad! Here I list the best ones and review every category of gamepads. The #1 emulator for GameCube and Wii. It offers excellent game compatibility and many helpful features. The #1 emulator for N64. It has good game compatibility, and conveniently comes bundled with the best plug-ins. An excellent emulator. Offers good options for handling the DS's dual display. Game compatibility is good and getting better. Visual Boy Advance is the #1 Game Boy and Game Boy Advance emulator! Offers lots of features and games run great. Focused on being fast enough to run on lower end hardware than other emulators support, without sacrificing accuracy or portability. A top emulator with near perfect compatibility, high quality performance, and a nice selection of features. The original SNES emulator! Although old, it still has some cool features that other emulators don't have. A top NES emulator. People tend to favor Nestopia over FCE Ultra. Nestopia has more features such as better screen filters. Versus Nestopia, FCEUX seems to be friendlier with computer compatibility. If Nestopia is acting up then try this emulator. The best cycle accurate emulator for Game Boy Classic and Game Boy Color. Although it lacks cool features such as what VBA offers. An excellent Saturn emulator with great game compatibility. 3D graphics render in higher resolution. Offers good features. An older Saturn emulator. Game compatibility is okay. But it's less prone to crash games than uoYabause. An excellent, powerhouse emulator that supports Genesis, Sega CD, 32X, Sega CD+32X, Game Gear, and SMS! This emulator is a build based on Gens, a legendary Genesis emulator. It also supports Sega CD and 32X. The first and best PlayStation 2 emulator! Offers good game compatibility. Its speed hacks really help for slower systems. The #1 PlayStation 1 emulator! Its strength is its awesome and flexible plug-ins system, but it can be tricky to setup for newbies. Not as awesome as ePSXe or PCSX-R, but it's easier to use (no fussy plug-in system) and works better on older/slower systems. Currently the best PSP emulator. It's open source and has ports for every system! Has the usual assortment of features. The #1 emulator for TurboGrafx16/PC Engine. However, it costs $30 US and does not support booting CD images. This is a free alternative if you don't want to pay for MagicEngine. Like MagicEngine, Ootake also does not support CD images. Supports nearly 20 systems: NES, SNES, Genesis, GBA, Saturn, PSX, and more! Even boots TurboGrafx16 CD images! Everyone knows about MAME. It's a powerhouse that supports ALL arcade games. However, it can be confusing for new users. FinalBurn Alpha is a top arcade emulator. It only supports Capcom, NeoGeo, Konami, and Cave games. Similar to FinalBurn Alpha, but offers more and cooler features. It only supports Capcom and NeoGeo games. A general run-through of video game emulation on Android. A massive emulator that supports over 40 video game systems!